Today, I thought I’d mix things up a bit by watching not a single film, but several shorts made by the same filmmaker. Georges Méliès was one of the cinema’s earliest pioneers, yet more than this, he was arguably the medium’s very first artist. A special effects innovator, he showed the world what movies were capable of, and what could be achieved with a little patience and a lot of imagination. It started when Méliès attended one of the first public “moving pictures” exhibitions, presented by the Lumiere brothers in Paris in 1896. A stage performer as well as an amateur magician, Méliès was overwhelmed by what he saw, and immediately recognized the potential this new medium held. When the Lumieres refused to sell him one of their cameras, Méliès built his own. At first, he was the star of all his movies, with family and friends chipping in to help. Eventually, he formed his own troupe of stage actors, and together they would create spectacular motion pictures, from science Fiction (A Trip to the Moon, in which five scientists are loaded into a rocket and shot from a huge cannon towards the moon, is easily his most recognizable work) to slapstick (The Black Imp features a hotel patron who’s tormented by a devilish creature that can make the furniture disappear at will), to pure fantasy (The Impossible Voyage sees a band of explorers fly through the air, walk on the sun, and do battle with a giant octopus under the sea). Between the years 1896 and 1912, Georges Méliès made over 500 shorts. Doing so was more than his profession; it was his passion. For the first time, film and art were joined as one, all thanks to a man who turned his back on the family shoe business to perform magic tricks in front of a contraption many considered a passing fad. 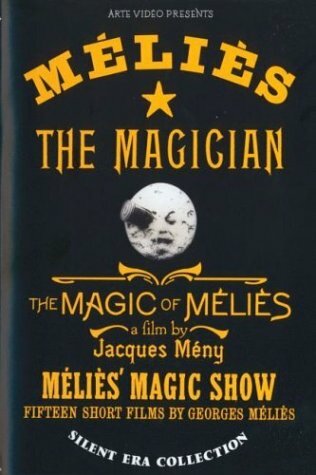 There are a number of DVD releases that focus exclusively on the talents of Georges Méliès. I’ve included links to some, and urge you to check them out. Also, Martin Scorsese’s award-winning 2011 film, Hugo, is a fabulous tribute to the earliest days of the cinema, with Sir Ben Kingsley playing Méliès. For movie enthusiasts, Hugo is a must-see. Finally, two of Méliès shorts are embedded below. I hope you enjoy them. Melies films are beautiful pieces of work, but seem almost alien to the modern audience. I've watched a great number of them while doing research on the origins of the horror film--he was the father of special effects, and also the first (as far as I know) to utilize supernatural elements in his films, even if it was intended to amuse and amaze rather than frighten. To me, they are best viewed in short bursts, two or three at a time, otherwise the same camera tricks over and over lose a bit of their flavor. They truly are fascinating, though. I recently watched Kino's Edison compilation. One of these days I'm going to have to do the same for Méliès films. And yes, indeed, Hugo was great, if for nothing else - to see some of Méliès films in the theatre! Jonny: I know where you're coming from. The films, as you say, are fascinating, but it's not so easy to sit through an entire two hours of them (good point about the camera tricks...many ARE repeated). Still, to see what he accomplished is a treat. In your research, what other early horror films did you come across? Any hidden gems out there? Klaus: I'm jealous! I have yet to check out the Kino Edison collection. It's now on my "short-list" of things to do. And yes, HUGO is a must-see! A tremendous movie. Thanks, guys, for the comments, and for stopping by! Jonny: That's one of the (many) things I like about Hugo -- it puts the Méliès films in their proper context, showing how they must have appeared to the audience of the time, rather than through our modern eyes (when even casual movie fans have opinions about different 3D processes, etc.). My mother is in her 90s and she remembers basically the entire history of movies as a commercial medium, and she loved Hugo because of how it recaptured how magical movies seemed back then.